In the eighties I did a weekly radio show for Radio Patapoe. The show was called ”De firma Dynamiet” and I played more or less the kind of music that I write about in this blog. But back then there were no CD’s yet and my record collection was much smaller then it is now, so played a lot of stuff from cassette tapes that I had recived from other collectors. Cuing cassettes was difficult, especially since the Patapoe studio built with rubber bands, paperclips and cello tape. I didn’t do the show very long. The studio was in an old squatters centre, and there wasn’t even a heating system. So when it became winter, I quit. I never felt that I was the right person for that station anyway, I was much to mainstream. The reason that I started doing this show was that I was asked by one of the people who run the station, B. He was a very nice guy. We exchanged a lot of tapes, and his tapes are among the best that I ever have received. I will write more about them later. One day B. was sent to prison because he refused to discuss his “oproep” for the army. ”Totaalweigeraars” , as they were called got a ridiculous sentence, I think he was in prison for TWO YEARS. I visited him a few times, but I could barely handle that. Here was a guy who refused to do any war-act, doing TWO YEARS IN JAIL among thiefs and dealers and other criminals. I still don’t know how he survived that. And shortly after he had done his time, compulsatory military service was abolished. Beam me up, Scotty. Later I got many of these records myself, but not all of them. There were many great Dutch records that I heard for the first time because B. had to go to jail. Ain’t life strange. 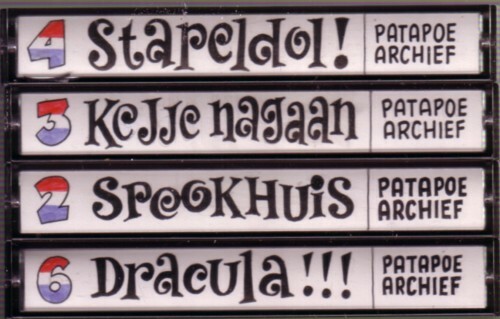 B. was also the very first person who ever sent me (half) a tape with Dutch advertisement records. In fact, because of this tape I started collecting these records! I must have kept that tape somewhere, but it is now too late to go and search for it.